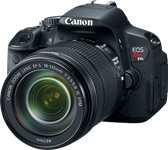 As in previous Rebel series cameras, the EOS 650D provides a comprehensive information display on the LCD, along with a 'Q' button to access the Quick Control menu. The main difference of course being that on the 650D both the button and Quick Control menu are touch-enabled. 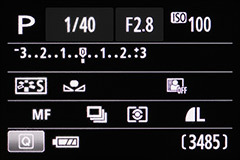 In viewfinder shooting mode the LCD displays the current shooting settings and a button to access the Quick Control menu. 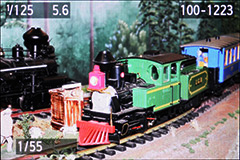 You can change the color scheme of this display, with blue and red themes replacing the green option on the EOS 600D. 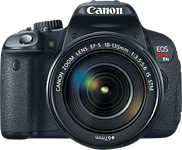 The 650D's LCD has been updated with what Canon labels Clear View II technology in order minimize glare when used outdoors and resist scratches as well as the inevitable smudges that come with touchscreen use. In side by side comparisons with the LCD of its predecessor, the EOS 600D, this redesigned screen shows only marginal improvement in bright sunlight. You'll still need to increase screen brightness to maximum in these conditions if you cannot angle the LCD into a more shaded position. Of course, the best solution - if you're shooting still images - is to simply use the camera's viewfinder. In weeks of real-world use we've had no scratch issues with the screen though, and outside of very bright sunlight conditions, finger smudges don't obscure the image view significantly. You can adjust the brightness level of the LCD on a scale of 1 to 7. The default value is 4. Quite helpfully, the real-world image Canon displays for you to evaluate the result is one of your own; it's the image you last selected when in playback mode. By default the EOS 650D provides a two second review display immediately after a shot is taken. This can be disabled or extended to 4 or 8 seconds. You can also choose to have the image displayed until you press the shutter button half-way or the camera goes to sleep, whichever occurs first. 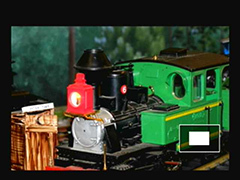 During record review you can press the dedicated erase button to delete the current image. Four display modes are available in record review and playback mode, as shown below. 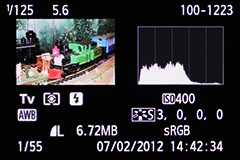 Histogram and detailed shooting information. 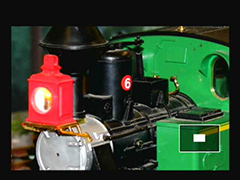 Blinkies will appear over images areas with clipped highlights. Luminance and RGB histograms. Blinkies will appear over images areas with clipped highlights. 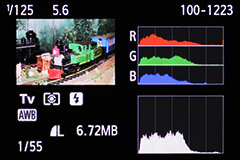 In the playback menu you can define which of the two histogram modes (luminance or RGB) will be displayed in the penultimate information view shown above. This choice will also determine the histogram displayed in live view mode. As on previous Rebel models, two magnification buttons can be used to zoom in and out during image playback. Yet the 650D's touchscreen also responds to smartphone-style gestures. You can spread or pinch two fingers to zoom in and out, respectively. You can move around magnified images by swiping your finger. In the non-magnified view you can swipe you finger to move to the next or previous image. There is a slight lag when swiping between photos, as the new image takes a brief moment to render at full screen size. With a fast SD card, the delay is not overly long, but the abrupt change in image size can be a jarring to view repeatedly. 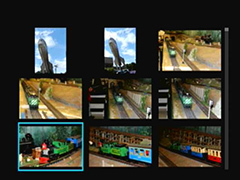 In this scenario, using the main control dial is the most efficient way to move between images. Particularly so because you can configure its 'jump' setting to move through images by date or star rating among other criteria. The 650D offers 15 discrete levels of magnification beyond its image-only view. And you'd be hard pressed to find anyone here in the dpreview office who enjoys holding down the zoom button while the camera cycles through each of them to reach maximum magnification. (High-end models like the EOS 5D Mark III allow you to customize the magnification level of the zoom button). The spread and pinch gestures, however, allow you to reach maximum magnification much more quickly and sensibly. And the ability to move around large swaths of the magnified image in one go, make the image review process feel like play, rather than a tedious chore. Of course you can forgo the touchscreen entirely and navigate through images using the 4-way controller and main control dial if you wish. We suspect, however, that Canon's well-implemented touchscreen navigation will hold wide appeal and be nearly irresistible to anyone who's used a smartphone. In the images below you see a range of playback magnification views, from the initial image-only view to maximum magnification. 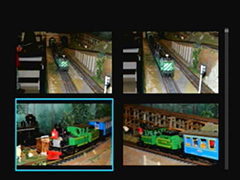 The 650D provides two levels of thumbnail indexes; a four image 2x2 grid and a nine image 3x3 grid. As you've probably guessed by now, you can use a touchscreen gesture to access these. Simply pinch two fingers in any of the standard playback views. Spread two fingers to work your way back up to the standard view (and beyond). With either index level displayed you can swipe up or down to scroll through additional sets of image thumbnails. Images and movies can be rated, providing a useful way of filtering your images on the go. And if you use Canon's bundled Digital Photo Professional importing and editing software, these ratings can be integrated into your editing workflow as well. 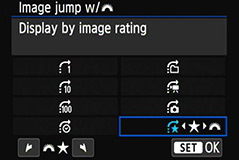 In the playback-menu you can set the 'Image Jump' function to only display rated images. The same can be done for slide-shows. 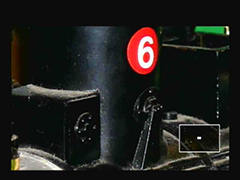 By activating the 'Q' menu in playback mode you can apply ratings to images via touchscreen buttons. You can change the behavior of the main control dial from its default previous and next mode and enable it to move through rated images only. Canon has issued a warning to owners of the EOS 650D/Rebel T4i that the rubber hand-grips of some models may turn white, and produce a chemical that can cause an allergic reaction. According to Canon, the chemical, zinc bis (N,N’-dimethyldithiocarbamate), is not used in the production of the camera but is a potential by-product of a chemical reaction between other substances found in the hand-grip. Click through for full details. Updated: We've had a production sample Canon EOS 650D/Rebel T4i for a few days now, and we've been busy running it through our usual studio and real-world tests, ahead of a full review. We've updated our previously-published preview with a gallery of 27 real-world samples from the production camera, both JPEG and converted Raw, and included some Raw files for you to examine yourselves. We've also added the 650D to our studio comparison database, allowing you to check out how it compares to its peers and predecessors in our standard studio test scene. Click through to see the additional samples. Just Posted: We've been shooting with Canon's latest entry-level DSLR - the Rebel T4i (EOS 650D), and have prepared an hands-on preview. The T4i shares many of the headline specs (18MP CMOS sensor, 9-point AF system, 1.0M dot flip-out LCD) with its predecessor, the EOS 600D / Rebel T3i, but significant changes have been made to every one of those features. The result is the first touch-screen DSLR and the first EOS to offer continuous AF in movie shooting mode. Read our preview to find out more about the 650D's features and what its 'Hybrid AF' really offers. The preview includes real-world samples and low-light studio shots. Canon has announced the EOS 650D (known as the Rebel T4i in North America), and 18MP touch-screen DSLR with a sensor-based hybrid AF system for improved focus in movie and live view modes. The camera gains the all-cross-type 9-point AF sensor from the EOS 60D and can now shoot at 5fps. It also adds stereo mics for its Full HD video recording, which is available at 30, 25 and 24fps. The camera will be available from the end of June at a price of $849, body only, $949 will the 18-55mm IS lens or $1199 with the co-announced 18-135mm STM IS lens.